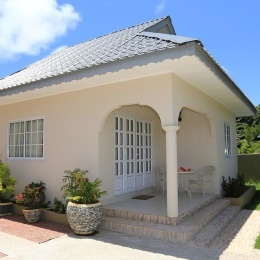 Anse Source D’argent Villa comprises three modern bungalows each with air conditioning, kitchenette, spacious living room, veranda overlooking attractive garden, shower, double bed, mini fridge, T.V and hairdryer. Each room is approximately 40 sq. m. excluding terrace and can accommodate two persons and includes an extra bed. The modern architecture and fixtures are complemented by soothing pastel colours, crisp lines and attractive layout. The residence is ideally located only 10 minutes from the La Digue jetty by bicycle you will find Anse Source D’argent Villa, your home away from home on Seychelles’ most traditional island where Time appears to stand still, among leafy, cobbled pathways and scented island tracks meandering to sublime beaches. A mere five minute walk away will bring you to beautiful L’Union Estate with its traditional coprah factory, giant land tortoise park and vanilla plantation and, soon after, to one of the planet’s most photographed beaches, Anse Source D’argent. We provide free transfer from the jetty and back and can organise such activities as full and half-day snorkelling to the nearby islands, bicycle rental, and exciting fishing trips.